In 2013, the American Psychiatric Association formally recognized gambling disorder as a disorder related to substance use disorders (as a form of addiction). Previously, pathological gambling had been listed with impulse control disorders as opposed to disorders that are more commonly associated with addictive behavior. Gambling disorder is commonly referred to in other contexts as compulsive gambling or gambling addiction. Gambling addiction is a serious mental health disorder that requires the intervention of a trained mental health care professional to assess and treat it. What Are the Symptoms of Gambling Addiction? The person expresses a need to gamble with increasing amounts of money to achieve desired feelings of excitement. The person becomes irritable or restless when trying to cut down or halt the gambling behavior. The person has made numerous unsuccessful attempts to either cut back or control gambling. The person has persistent thoughts about gambling or is occupied with gambling behavior. The person often gambles when stressed or anxious. The person often returns to gamble after losing money. This return is an attempt to “get even” or to recover losses. The person lies to conceal gambling behavior. The person’s gambling has jeopardized or resulted in job loss, other lost career opportunities, important personal relationships, or educational opportunities. The person relies on others to provide money to relieve financial burdens caused by gambling. Of these nine symptoms, the individual must exhibit four or more in a 12-month period in order to be diagnosed with a gambling disorder. Moreover, because individuals who have bipolar disorder often exhibit risky behaviors such as compulsive gambling, an individual who has bipolar disorder or who is expressing mania would not be diagnosed with a gambling disorder. Individuals can be diagnosed with an episodic gambling disorder or a persistent gambling disorder, depending on whether or not their behavior is consistent or intermittent. In addition, the disorder can also be ranked according to how severe it presents. Someone with a mild gambling disorder would meet 4-5 of the above diagnostic criteria. Someone with a moderate level gambling disorder would satisfy 6-7 of the diagnostic criteria. Someone with a severe gambling disorder would satisfy 8 or more of the criteria. This designation of severity can help to guide individualized treatment approaches. These types of disorders are easier to treat if they are caught early in their progression. Often, but not always, people will display fewer symptoms earlier in the course of the disorder. Gambling addiction is linked with other psychological disorders and has high comorbidity with depression and mood disorders, anxiety disorders, and some personality disorders. Gambling addiction also has high comorbidity with substance abuse. It appears that when someone is diagnosed with gambling addiction and another disorder, the most common additional diagnosis is a substance use disorder. The relationship between problematic gambling and substance abuse has been acknowledged for quite some time. Recent research looking at the relationship of gambling disorder and substance abuse indicates that the substances that are most commonly abused by individuals suffering from gambling addiction are alcohol, tobacco, marijuana, and stimulants. Some studies find lifetime prevalence of alcohol abuse or alcoholism in individuals with problematic gambling to be extremely high. 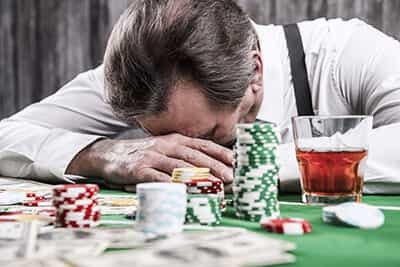 The American Psychiatric Association notes that gambling disorder may predate the development of substance abuse issues, and perhaps the association between alcohol use disorder and gambling disorder reflects the availability of alcohol in casinos and other venues that individuals with gambling issues often frequent. Tobacco use disorders and marijuana use disorders are also noted to be common among individuals with gambling disorders. Younger individuals with gambling disorders may also have higher rates of addiction to amphetamines or stimulants. All types of addiction involve the activation of the reward center of the brain; therefore, they share several neurobiological similarities. While there are similarities between gambling disorder and substance use disorders, there also several differences. Chemical dependency refers to the development of a physical reliance on certain types of substances, such as alcohol, certain opioid medications, and several other different types of medications. When the body maintains a particular cellular level of these substances, it learns to rely on the substances. When they are removed, the individual may experience physical withdrawal symptoms. There is no similar physical withdrawal when a person with gambling disorder stops gambling, but the individual may experience some uncomfortable psychological symptoms. Withdrawal from alcohol can be life-threatening if it is not monitored properly. Someone with a gambling disorder does not develop the same type of physical dependency that results in the strong physiological need for gambling behavior. Thus, the treatment for certain types of substance use disorders, such as alcoholism, requires a monitored detox program, whereas gambling disorder does not require such a program. That being said, some individuals with gambling disorder can benefit from an initial residential treatment program to separate them from their environment to reduce relapse risk. In addition, the treatment for a dual diagnosis of gambling disorder and substance use disorder will vary depending on the type of substance the individual was abusing. Individuals abusing marijuana, tobacco, or even amphetamines may not require the same level of initial monitoring that addiction to alcohol, benzodiazepines, or opiate drugs requires. Treatment for gambling disorder may consist of either individual or group therapy. The therapy that is most often used in the treatment of gambling disorder is Cognitive Behavioral Therapy (CBT). CBT addresses patterns of thinking and beliefs that are dysfunctional, and helps the individual change them along with changing behavior. CBT is also extremely useful in the treatment of substance use disorders. In terms of gambling addiction, the therapist and client will often break down the client’s gambling behavior into the antecedents (events that occur before), actual gambling, and the consequences (events occurring after gambling). This is known as a functional analysis of behavior. Dissecting the person’s gambling behavior helps the client understand triggers for gambling and develop strategies to deal with these triggers. In addition, the client begins to understand the personal consequences that come from compulsive gambling. Often, these consequences are weighed in terms of short-term and long-term consequences. Since most individuals in treatment for gambling addiction learn that the long-term results of their gambling behavior are negative, the focus is on attaining positive long-term consequences; this always means ceasing pathological gambling. The therapist and client keep a record of gambling and non-gambling days, and clients are encouraged to reward themselves when they do not gamble. At the same time, the therapist and client identify and change the client’s irrational beliefs regarding gambling behavior. Treating a comorbid substance abuse issue involves addressing the substance use disorder concurrently with the gambling disorder. CBT addresses substance abuse in a similar way by identifying the antecedents and consequences of the behavior, and then changing the behavior by addressing these triggers and reinforcers. CBT will often teach stress management techniques and address stress by teaching the individuals to use breathing, relaxation, and imagery to cope with potentially stressful situations or events. This can be applied to issues with substance abuse and to issues that lead clients to want to gamble. CBT can be administered in an individual or group setting. It is crucial to treat the gambling use disorder and the substance use disorder at the same time. Attempting to treat one prior to the other is not an effective strategy, as individuals experience higher rates of relapse and other difficulties when both issues aren’t effectively treated. Since the two disorders support one another, they must be addressed concurrently. Individuals with gambling disorders and substance use disorders can also benefit by attending 12-Step programs designed to address each disorder. Gamblers Anonymous is a 12-Step program that is specifically designed to address the issues associated with gambling addiction. Alcoholics Anonymous, Narcotics Anonymous, and other 12-Step groups are designed to specifically address these substance use disorders. 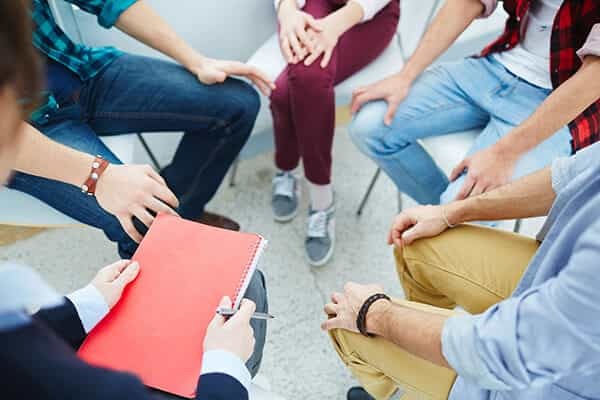 Individuals with co-occurring gambling addiction and substance abuse issues could attend whatever combination of support group meetings works for them. For instance, someone with a gambling disorder and alcohol use disorder could attend Gamblers Anonymous meetings as well as meetings of Alcoholics Anonymous. Since 12-Step groups operate on many of the same principles, attending both types of meetings over the same period of time should not be confusing or overwhelming. Individuals can often use information from one group and apply it to the other disorder (e.g., something learned in a 12-Step group for substance abuse can often easily be applied to recovery from gambling addiction). The one thing that is clear is that individuals who meet the criteria for gambling disorder will require some form of supervised recovery program to address their issues. Most people who try and curb their behavior without formal treatment or without outside supervision and assistance will nearly always find themselves caught up in a cycle of very short periods of abstinence followed by relapsing back to their prior behavior.